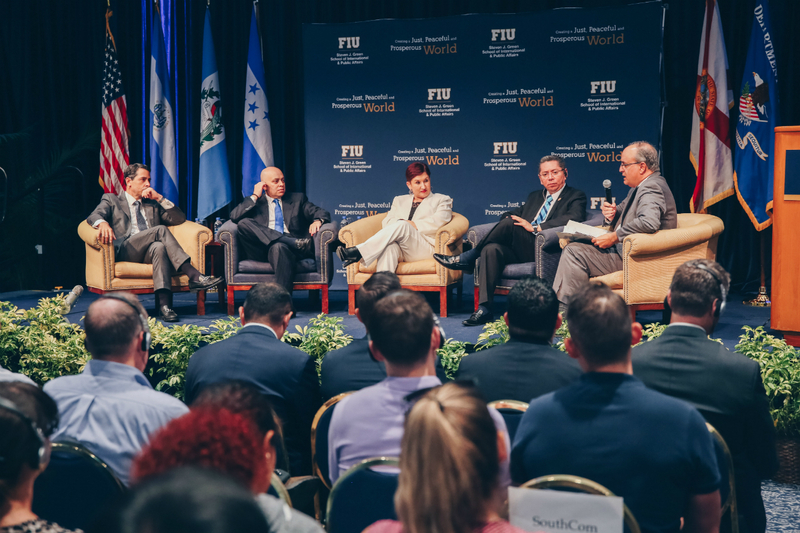 From left to right: U.S. Acting Assistant Attorney General Kenneth A. Blanco, Attorney General of Honduras Oscar Fernando Chincilla Banegas, Attorney General of Guatemala Thelma Aldana Hernandez and Attorney General of El Salvador Douglas Arquimides Melendez Ruiz during the discussion with Frank Mora, director of the Kimberly Green Latin American and Caribbean Center. Over the past six months, the Department of Justice has been taking action to defeat the gangs that are threatening the U.S. and the battered countries of Central America’s Northern Triangle. The officials also discussed their strategies on combating gangs, crime, drug cartels and corruption with Frank Mora, director of the Kimberly Green Latin American and Caribbean Center (LACC), moderating the discussion. John F. Stack Jr., founding dean of the Steven J. Green School of International and Public Affairs, welcomed and commended the officials and their agencies for their hard work in representing the U.S. and the Caribbean. Central American gangs such as MS-13 – or Mara Salvatrucha – are among the most violent in the world and are active in major U.S. cities, including Los Angeles, New York and D.C. The researchers released “The New Face of Street Gangs: MS-13 and the Gang Phenomenon in El Salvador,” finding that gang desistance is more common than usually believed. Members can leave through negotiation with gang leadership or involvement of religious or non-governmental organizations that can provide a safe space for former gang members. The officials stated that they believe their joint efforts in the regional fight against transnational crime and gangs will help provide a safe and peaceful environment for the citizens of their countries.